Having trouble thinking of ideas to get the kids away from the TV or PlayStation these school holidays? Especially after all the food and sweets you’ve all eaten over the Christmas period? Do it, get out of the house and take the whole family with you! Read on for some fantastic summer activities in Perth that will keep you fit and healthy heading into the new year. Located just 100km from Perth, Lane Poole Reserve near Dwellingup is not too far from home so you can even make a day trip out if it! Load the whole family (and the dog) into the car so you can breathe in the fresh air. Make sure you book your session beforehand (always keep a look out for Groupons) and choose a time that suits you. Each session goes for 2 hours and you will have a training session beforehand. Use the 2 hours to get through as many of the courses as you can. Starting from easy obstacles for children and slightly more challenging for those not too keen on heights to Extreme Black Runs for the thrill seekers. The whole family can swing, leap, climb and fly through the forest allowing you to experience the trees like never before. For those not wanting to climb, the spectator areas offer seats and a clear view of the courses, so you can cheer on your loved ones. Once the session is over, cool off and jump into the Murray River for an afternoon swim. Yes dogs are allowed and yes there are BBQ facilities. No there is no phone reception. Take time out to soak up the sunshine and family time not having to worry about updating your Facebook status. The reserve also offers great spots to camp for just $10 per person if you want to spend the night. Get ready to pitch your tent and enjoy nature. 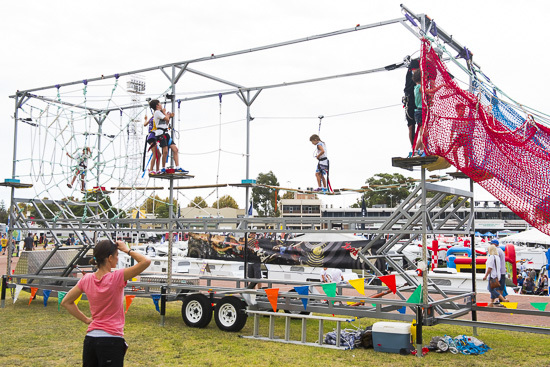 If you wish to hold your own tree climbing event, Monsterball Amusements & Hire can hook you up with the only mobile High Rope you could find in WA..Contact us for more info! SUPA GOLF is a modified form of golf where the golf clubs have oversized plastic heads. Similarly the ball is also oversized, softer and made of rubber plastic and iridescent in colour. Located in West Australia’s beautiful Swan Valley, enjoy some fun in the sun with the whole family. The oversized nature of the club described above makes it much easier to play than traditional golf. This makes it more kid-friendly far more enjoyable because you may actually be able to get a ‘hole in one.’ This activity was quite popular before technology took over. We think it’s time to bring it back! Oasis Supa Golf is open seven days a week, so you can take the kids out on the weekend. There are 18 holes to get through! This is a great way for your family to get out and about, walking around this summer. Feeling like a superhero and learning how to fly is every kid’s dream, this summer iFly has made that possible. Indoor skydiving is the latest actions sports trend sweeping the globe and it’s finally flying in Perth! This incredible technology now allows people as young as 3 years old to experience what it feels like to fly. You’ll be coached by a qualified trainer and make your way through different air speeds. You are in a controlled environment and everything is safe (unlike actual skydiving!!). Your loved ones will be watching through the viewing deck. There are beginner packages all the way to extreme for the adrenaline junkies. If you are looking for something unique to do this summer, then we’d recommend giving this a go. This is a great way you and your family can get out of the house and experience something new and exciting for the first time together. Only 4kms away from Perth CBD, experience great entertainment and value for all ages at Australia’s largest inflatable pop up water park. 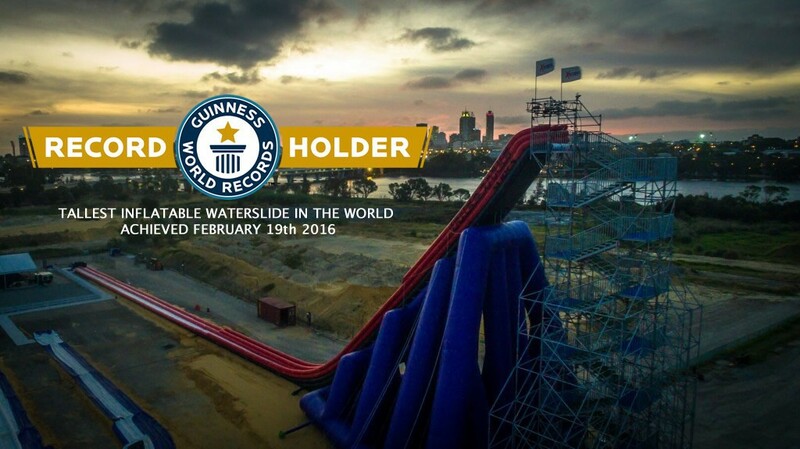 Splash City currently holds the title for the tallest inflatable water slide in the world according to the Guinness World Records. Standing at a crazy 22m high, you will get a fantastic view of the city as you slide down. The family fun park includes a range of inflatable waterslides, an inflatable maze and obstacle course as well as dry activities. Opening from 10am-5pm, you can spend the whole day there cooling off with the water fun. The $28 admission fee is very reasonable considering you get access to all of these amusements. Family passes are available too. Splash City gives you the ability to lead an active day with your kids. Get in line! If you like the idea of pop up water park, why not create your own one with Monsterball Amusements & Hire ?! Grab a bunch of friends or maybe a group from work and get on board with this new and exciting sport! This isn’t your typical ball game. 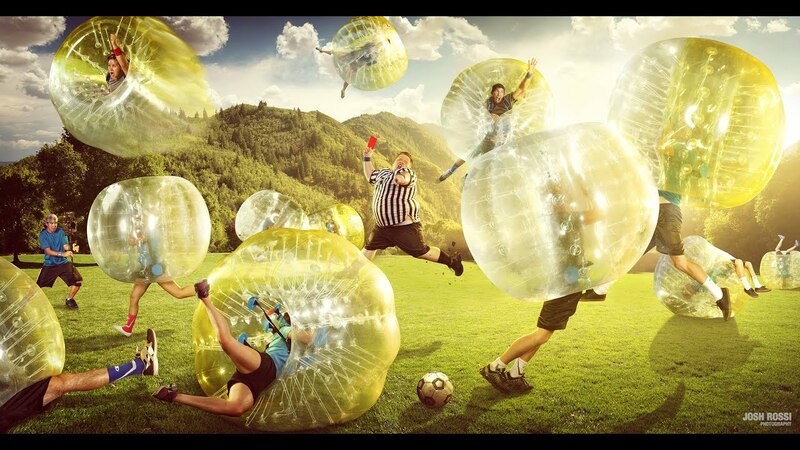 Bubble Soccer involves climbing inside an inflatable bubble and rolling, bouncing and running around to your heart’s content ( Are we the only ones getting excited about this?). We all hate cardio (most of us mere mortals anyway) and this is a fantastic idea to get a great cardio workout in. It’s fun to play and hilarious to watch. Monsterball Amusements & Hire here in Perth can recommend game times or even tournaments. There is an inflatable arena to keep you within a 20x10m boundary. Excellent idea for private or corporate functions.